Adopting a multidisciplinary approach with input from physicists, researchers and medical professionals, this is the first book to introduce many different technical approaches for the visualization of microcirculation, including laser Doppler and laser speckle, optical coherence tomography and photo-acoustic tomography. 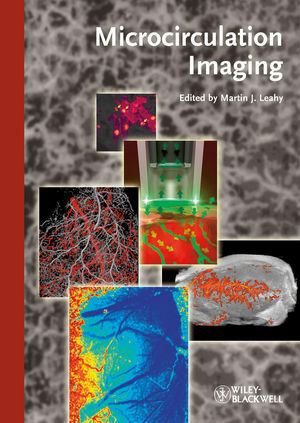 It covers everything from basic research to medical applications, providing the technical details while also outlining the respective strengths and weaknesses of each imaging technique. Edited by an international team of top experts, this is the ultimate handbook for every clinician and researcher relying on microcirculation imaging. Prof. Martin Leahy completed a DPhil at the University of Oxford and he was the founding Director of R&D at Oxford Optronix Ltd. From 1995 he had various research and teaching posts at the University of Oxford. He has secured more than 6M in external R&D funding since 2003. He is an adjunct professor at the Royal College of Surgeons, Fellow of the Institute of Physics, Fellow of the Royal Academy of Medicine in Ireland and Fellow of SPIE. He is a co-chair, executive organizing committee member and panel moderator for SPIE Photonics West BiOS in San Francisco, host of the BioPIC European Bioimaging conference and Editorial Board member of the Journal of Biomedical Optics. Prof. Leahy was founding MD of Limerick West Windfarms Ltd. and Millstream Energy and PI on the research projects that spun out Biomass Heating Solutions Ltd. and Wheelsbridge AB. Since his return to full-time academia, he has played a leading role in graduate biophotonics education through NBIP, UL, NUI Galway and the Biophotonics and Imaging Graduate Summer School. In 2010 he delivered a dozen international invited lectures and published more than a dozen ISI journal articles. Martin Leahy was appointed Chair of Applied Physics at NUI Galway in April 2011.